WASHINGTON, D.C. - In cooperation with the U.S. Consumer Product Safety Commission, Graco Children’s Products Inc., of Exton, Pa., is providing new instructions for about 538,000 “Pack ‘n Play” portable play yards with raised changing tables. When children are placed in these portable play yards when the changing table is still in place, they can crawl under and lift the table up. If this occurs, a child’s head and neck can become trapped between the changing table and the play yard rail, causing a strangulation hazard. The recall is designed to warn consumers of this hazard, and to provide warning labels to affix to the changing tables. The commission and Graco are aware of the death of a 13-month-old girl, who strangled when her neck became trapped between the Pack ‘n Play rail and the raised changing table. 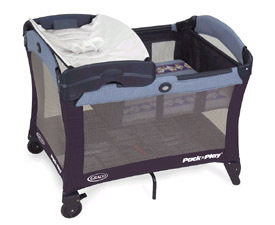 Only “Pack ‘n Play” portable play yards with raised changing tables are part of this recall. They also are sold with an infant bassinet. “GRACO” and “Pack ‘n Play” are written on the side of the play yard. These play yards have model numbers 2016, 35235, or model numbers that begin with 9531 or 9533. The last three digits of the model number will vary. The model number can be found on a label on the white plastic center cone under the play yards. “MADE IN CHINA” also is written on the bottom label. Models 2016, 35235, 9531 and 9533 that are currently sold at retail and that have green stickers on the boxes, indicating that the unit has been modified, are not recalled. Hotel And Leisure Living Services Ltd., under the Hotel Fun 4 Kids™ Program is committed to improving the quality, accessibility and safety of cribs used for children in Hotels. See important safety information below about Unsafe Cribs in Hotels. We offer high quality full size and portable cribs, mesh play-yards (portable cribs) and our new mini-cot together with quality bedding products selected and designed to help reduce the risks to children when travelling and using hotel cribs or for use in resort nursery programs. All Cribs meet United States and Canadian Safety Standards. Consider providing Families with options for sleeping accommodations for children as part of your guest services. We would like to help you introduce this service as part of your hotel room facilities. Go to Hotel Fun 4 Kids™ Sleeping Options for Children for more information. To learn more about the other services we offer go to HOTEL FUN 4 KIDS™ SERVICES. Another danger that may be present with hotel cribs is the risk that hotel cribs may be disposed of in an unsafe manner or donated to a local shelter as a well-meaning gesture. Improper disposal of cribs not only presents a risk to the children that may be the recipients of the cribs but also presents a liability issue to hotels. . The following excerpt is from a press release issued by the Consumer Product Safety Commission on July 12, 2001. Go to Crib Safety News for full press release.